The occupying Sri Lanka Air Force (SLAF) is deploying at least 16,720 acres of public lands in Vanni, which have earlier been taken over by the Forest Department of genocidal Sri Lanka. The SLAF controls 8,500 acres of lands in Ampa-kaamam, 3,500 acres from Karippadda-mu'rippu to Ira'nai-madu and 2,200 acres in Keappaa-pulavu, where uprooted Tamil villagers are demanding de-militarisation and proper resettlement. In the meantime, The SL Navy base known as ‘SLNS Gotabaya’, which comes under the so-called Eastern Naval Area (ENA), has been officially allocated with 671 acres despite repeated protests from private land owners. 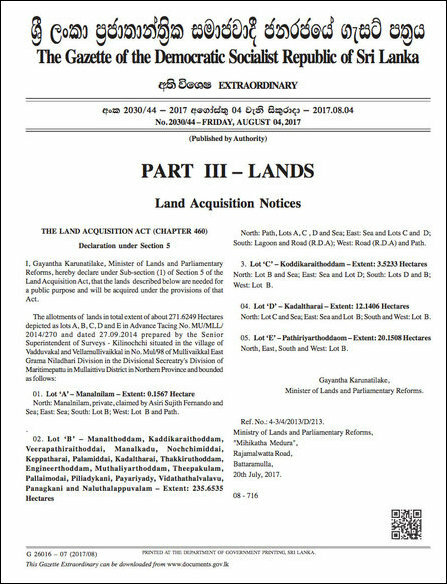 The lands being allocated to SLNS Gotabhaya in Mu'l'livaaykkaal East also contains crucial evidences and traces of genocidal onslaught against Eezham Tamils in 2009 where the final onslaught took place in May 2009. The area has been seized by the SL Navy for the so-called ‘Regional Security Centre’, monitoring the coastal belt of Mullaiththeevu towards the Bay of Bengal. The lands that belong to private owners have been illegally occupied since 2009 and there are crucial evidences still intact in the area, the people say. Despite repeated complaints against the move to seize the lands for military purposes, the SL Land Ministry and Land Department officials have given green signal for the seizure, civil sources in Mullaiththeevu said. In the meantime, SL Forest Department and Wildlife Department are planning to take over more lands in Vanni, the sources further said. So far, the occupying SL Army has been concentrating on seizing strategic locations, fertile farmlands, industrial zones and settlement areas for Sinhala colonies. But, the SLA has also been demanding ‘Forest Lands’, the sources further said. The SL Navy ‘Gotabaya’ camp was initially launched as a Naval Deployment (ND) in January 2011 and was later upgraded as a Commissioned Naval Base (CNB) with the title ‘Sri Lanka Naval Ship Gotabhaya’ in 2012. 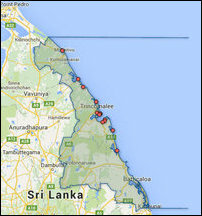 The SL Navy has put up barbed-wire fences annexing the seized lands with SLNS Gotabhaya. Several naval detachments connected to ‘Gotabhaya’ are functioning in areas subjected to demographic and structural genocide in Naayaa'ru and Kokku'laay areas of Karai-thu'raip-pattu division. The ‘SLNS Gotabaya’ comes under the so-called Eastern Naval Area of the SL Navy Command, which has its central command at Trincomalee. 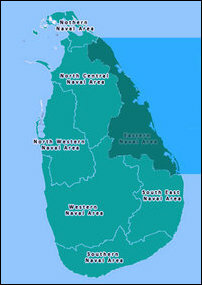 The ENA covers the longest eastern belt of the occupied country of Eezham Tamils, and consists of 13 Commissioned Naval Bases (CNBs). The ENA is the largest establishment within the SL Navy in the entire island. 03.08.16 Eezham Tamils in Mullaiththeevu protest against expansion of..
08.01.18 Sinhala Air Force, Navy compete with occupying Arm..
27.10.17 Occupying SL Navy wants surveying of Mu’l’livaaykk..
ஆர்வத்துடன் பார்க்கும் உங்களுக்குப் பாராட்டுகள். பிறரிடமும் காணுமாறு சொல்க. உங்கள் கருத்துகளையும் பதிக.நன்றி. எசு.ஆர்.பாலசுப்பிரமணியத்திற்கு மாநிலங்களவை பதவி – வாசனுக்குப் பெருமை சேர்க்கிறது! பட சாளரம் தீம். தீம் படங்களை வழங்கியவர்: luoman. Blogger இயக்குவது.